Click on the links below to find out all the info on this amazing product!! signed by Professionals. Check back often!! People will think nothing of spending $300-$500 for a driver. A low end putter can range from around $100 and go up. A high end putter can cost upwards to $250. Wouldn't you like to have something that would be unique, be a collectible and help your golf game? Now you can! 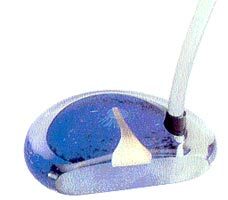 Golf Putters made of glass? YES... you CAN PLAY golf with them! The handcrafted putters of glass that conform to Professional Golf Association Rules!!! Collectible putters made of glass! Read some customers' comments ...from golfers who use Putters of Glass!! you really can putt with our golf putters!